Hollywood 5: Infinity out now! After two years of development, Airsoft Softwair is proud to annouce the immediate availability of Hollywood 5: Infinity for AmigaOS and compatibles and Microsoft Windows. This is a massive update which boasts over 120 new functions in comparison to Hollywood 4.8 and brings along many new features and general improvements. Highlights include the ability to play video streams, full Internet and network support (you could even run a server with Hollywood now! ), support for real vector graphics and vector image formats like SVG, hardware accelerated double-buffering, inbuilt synthesizer functions and much much more. Hollywood 5: Infinity is undoubtedly the most advanced Amiga multimedia application and on Windows it is a fresh Indie alternative to bloated authoring systems that need tons of DLLs, memory, and hard-drive space. Hollywood is highly stable, extremely easy to use and flexible, and used by many creative people around the globe. A totally unique feature is the ability to cross-compile native executables for many different platforms including: AmigaOS3, AmigaOS4, WarpOS, MorphOS, AROS (x86), Windows (x86 & PPC), and Linux (x86 & PPC). * Hollywood can now compile for PowerPC Linux too! * Standard library set encompasses over 600 functions now! Hollywood 5: Infinity is the ultimate Multimedia experience and a must-have for all creative people. 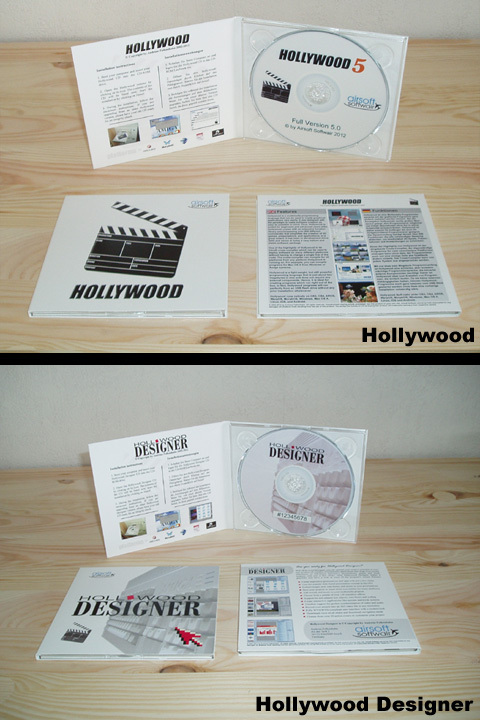 Hollywood is available on a CD-ROM and as a download version for AmigaOS compatible systems and for Microsoft Windows. The CD-ROM version is delivered in a nice Digipak (photo). If you order the download version, you will have to download an ISO image which you need to burn on CD-R then. If you already own Hollywood, you can buy a discounted upgrade version. Customers, who have bought Hollywood 4.8 after January 1st, 2012, can apply for a free upgrade. Screenshots of Hollywood 5 are available on the Airsoft Softwair homepage. All this makes Hollywood The Cross-Platform Multimedia Application Layer. Join the Multimedia revolution and get your personal copy of Hollywood 5: Infinity now! Re: Hollywood 5: Infinity out now! That time I'm first ? EDIT: since I'm ordered the digital download version for speed reasons, Can I get the CD version adding something for delivering? Is there support for OggVorbis or some other completely free music system to replace Mp3:s? This is absolutely awesome. Buying shortly! I was wondering, seeing as Hollywood supports deployment on AOS 3.x, is there a list of functions one should be aware to stay away from when developing for it? I mean, streaming video on my A1200@020 seems a bit ambitious, even though it's now available. I've been waiting mainly for networking so this is excellent, definitely buying shortly. Now I buy and pay the version for AmigaOS and Windos, I'll hope soon have both versions and correct some problems with my Sirena Player. You were first this time. Contact me if you want CD versions. Ogg Vorbis support will come soon in form of a plugin. Streaming video works fine on WinUAE at least. On real classics it is of course too slow. Wow, I was so disappointed that I didnt see Android support in the list, and now im reading in the forum there actually is Android support (although through you). That was great news! Oh yeah, how is it with android, does it work with both android tablets as well as andorid mobiles, or is it same way as in Apple world that Iphone and Ipad are different toeach other, hence only ipad works? How to code for that OSes? How to manage touchscreen?